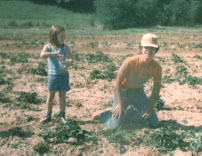 In 1979, Patty Schrader (maiden name) became the first female employee hired at Lakeview Farms. Patty was a very likeable and hard working young lady who went on to work several years at Lakeview Farms and, like her brother, Tim, helped get Lakeview Farms off the ground. 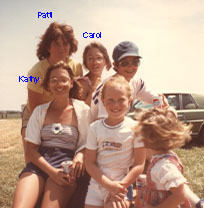 Because Patty was so regular and hard working, the most memorable incident I can recall was (about 2001) several years after she completed nursing school, residency, and had a family of her own. Her daughter came with a Grace Preschool group to visit the farm at pumpkin time and mentioned her name, Ziegemeier, and that "her mother used to work here". I then spent several minutes talking to the whole school group (about 50 kids) about her mother being the first female employee of Lakeview Farms, and her grandfather, and great grandfather who owned the land where Schrader Farms and Aspen Point subdivision now stands. At the end of that short little talk, everyone in the school group was convinced that Patty's daughter was indeed a Very Important Person. Patty is currently living in Old Monroe, works as a physical therapist and usually visits the farm during strawberry season.